This barn quilt is hiding on the side of the barn that faces the cross road. I drove right past it and then spotted the block as I came from the opposite direction trying to hunt down the address. This is the Honebrink barn in Belle Plaine, Minnesota. Getting a picture of the block itself was something of a challenge. I was fully zoomed on my camera taking the barn picture from the road. I took the pictures for the block from a closer spot, but that made the angle a bit odd, and the detail is still a bit grainy. The quilt block on this barn is a custom block with a story behind it. I love this. Quilts should have stories. 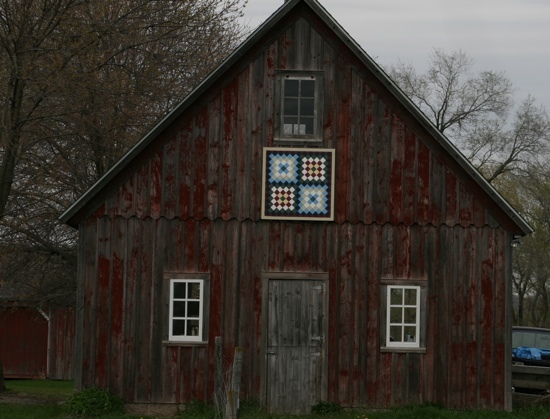 The barn belongs to Brian and Suzanne Honebrink and the design comes from the pattern on the last quilt made by Meta Luebke, Brian’s grandmother. 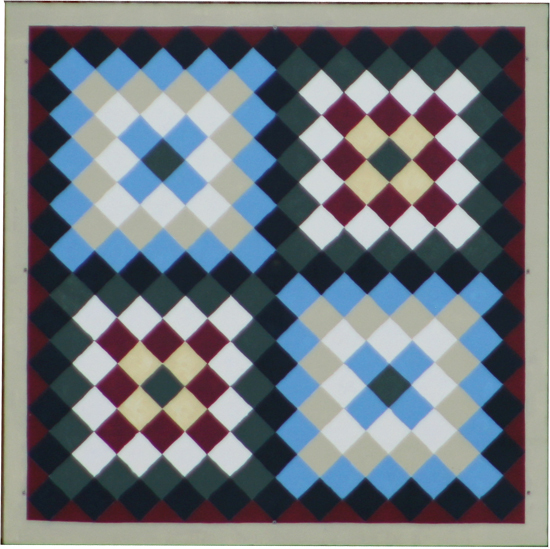 This barn quilt block was created in 2011. 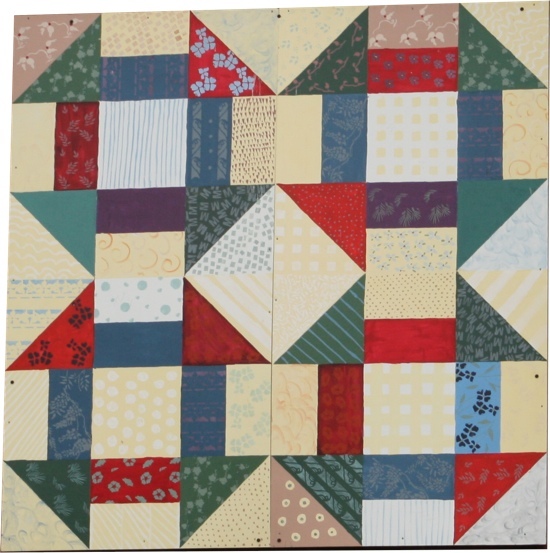 Suzanne worked on the barn quilt block, painting the details of the calico fabric patterns. Meta passed away in 2013 at age 107. A few miles down the road, I spotted this sign. I’m still feeling a bit overwhelmed by tonight’s Sample Spree at Quilt Market in Pittsburgh, but I do have another barn quilt for you. Today’s photos come just south of where we started a few days ago at the Miller Barn. This is the Drees Dairy barn, located at 10925 County Road 152, in Cologne, Minnesota. This block is called “Hopscotch”. I am heading to Quilt Market today! Here is another barn quilt for you. I love these! This is the E. Willems Barn, located at 10720 County Road 153 in Cologne, Minnesota. This block is called “Triple Tulip”. 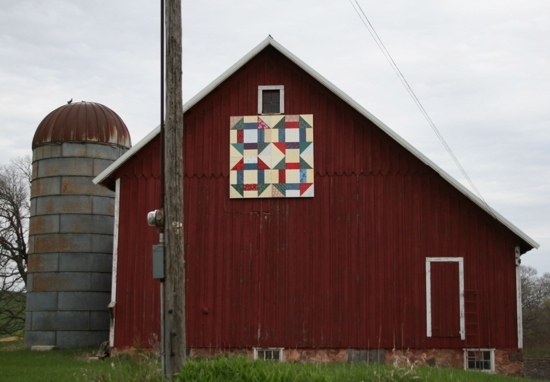 Here is another barn in this week’s tour of Carver County Barn Quilts. This is the Schreiner Barn, located at 9380 County Road 140, in Cologne, Minnesota. The block is called “Trip Around the World”. This one looks great on the barn, but looking at the square by itself makes my eyes feel blurred. I think it is the light blue/brown combination. I took a bunch of shots of this one on various camera settings and they all feel that way to me. Quilt Market is this week, so I thought it would be a great time to share some more barn quilts from the Carver County Barn Quilt Project. This is the Miller Barn, located at 11650 Laurel Avenue in Cologne, Minnesota. The block is called “Hole in the Barn”. It is also known as the “Monkey Wrench” block.